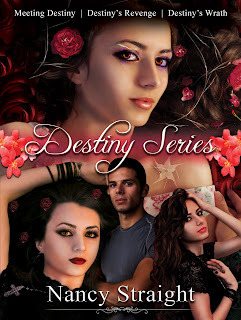 Author Nancy Straight: Destiny Series Boxed Set - Released today!! Destiny Series Boxed Set - Released today!! Can you believe it's already mid-February? Yeah, me either! Book 3 of the Touched Series is nearly done, in fact it should be heading off to my editor this weekend! Once it's outta here I'll have to figure out a title for it. My son has come up with a few ideas. For those of you who know me - you already know Book Titles are BEYOND difficult for me. LOL! Hope to have a title and a cover before March 1. Expected release will be sometime in April. A couple weeks ago I was in Florida hanging out with some fabulous authors. Tiffany King suggested that I bundle the Destiny Series as a single book. She had done it with her Saving Angels series and her fans liked being able to get all three books in her series all at once. Since I think she's one of the coolest ladies I've had the pleasure to meet, I decided to give it a try. I'm still waiting on the paperback cover to be finalized, but I plan to offer all three in a single paperback, too! Congratulations. I think it's a great idea. I like being able to get the series in one package. Then, I don't have to go back to get the others, especially if it's an author I know I like. I've finished reading Meeting Destiny and had a wonerful time. Now, I'm almost finished with Blood Debt. I will be reading more! !